Seize the day and dance the night away once a month in Silver Spring! 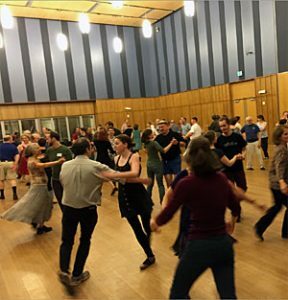 On the second Thursday of each month, join us at the Silver Spring Civic Building for contra dancing. Presented by Carpe Diem Arts in partnership with the Folklore Society of Greater Washington and Washington Revels, with support from BE ACTIVE: Montgomery Country Department of Recreation, these monthly dances are for everyone — no experience necessary! You’ve been able to exercise your vocal cords with us every month at our Community Sings, and now you can get your feet moving, too. The dance begins at 7 pm with 30 minutes of introduction for beginners, and the dances run from 7:30-10 pm — all dances are “called” (this means the steps are called out loud so you can follow along). Each month features a new band and caller. Admission is FREE for first-timers, then $10 general admission to future dances (or $8 for FSGW, BFMS, CDSS, or members of the Washington Revels communities; $5 for students and those without income).